This may seem like common sense, and probably is to most, but try it. There is music you like. You have a favorite song whether you can name it or not. There is a sound you are attracted to. That’s just how it goes. Chances are, your music is emulating something you heard a lot of as a child that you are subconsciously remembering, or a band you like now. If you listen to rap, try rock. If you like country, try pop. If you like techno, try classical. Broadening your musical horizon will give you more ideas about how to produce different music. We all have that style of music that we love to listen to, and/or prefer to produce. For instance, I enjoy rock. I noticed that all my songs seemed to follow the same sound. So I tried a “world” approach. I made some Japanese tracks and some Celtic tracks. The Japanese tracks became featured on the YouTube channel WasabiCars! So I got complacent with that. Then I wrote a rap. Now I’m working on more modern sounding film score music. If you just think outside the box, regardless if you like to or not, you will start to hear different sounds then you are used to. You may even find that you have a skill in another genre. Well it’s pretty obvious, but to have your music sound different, use something to literally make it sound different. Since I, like most of you, am on a budget, Logic Pro 9 and Pro Tools 9 becomes my band, orchestra, choir, or whatever I need. When I first started using Logic, I found a drum kit that I really liked. I realized that I kept going to that one over and over again. I picked a different drum kit, put a different reverb on it, added some delay, and compressed it. BAM! A completely different sound! Now don’t trap yourself and use the same rhythm. A different sound deserves a different rhythm. Don’t Use Presets or Loops! This could be one of the biggest reasons that your music may not only sound the same to what you make, but why it may sound the same to what others make. I won’t spend too music time on loops because it’s obvious: anyone can use them. Unless someone is paying you next to nothing for music, just don’t use them. It is very easy to throw in a digital instrument or plugin and just start recording. You may create something that sounds quite good, but then the next time it’s the same, and so on. Change the settings! 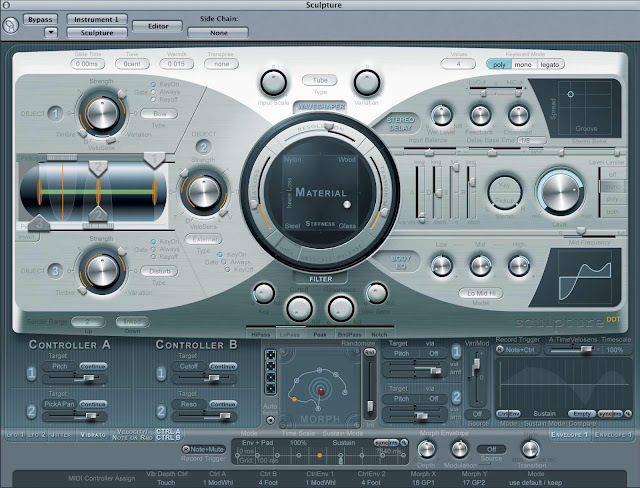 In modern DAWs, each plugin usually has a crazy amount of settings! Tweaking just two knobs and flipping a random switch can create a drastically different sound. You don’t even need to know what you’re doing. Just do it, and listen. As mentioned, these four steps may have been common sense to some, but there are probably a few of you out there that may be just starting out, and are stumped. Try out these steps. They may help you break out of your creative box that you have put yourself in. Do what you like, but don’t be afraid to try something new. Most importantly, have fun with it! I hope I was able to help some of you guys of there! Produce on brothers and sisters; produce on.